TV show dates: September 14, 2016 — August 20, 2017. Voice performers include: Josiah Johnson, Quinn Hawking, Michael Starrbury, Jay Pharoah, Tiffany Haddish, Jamie Kennedy, Poochie Jackson, Carl Jones, Elise Marie Dubois, and Lavell Crawford. An animated adult comedy from creators Brad Ableson, Mike Clements, Quinn Hawking, Josiah Johnson and Michael Starrbury, the Legends of Chamberlain Heights TV show follows three high school basketball players. Jamal (Hawking), Grover (Johnson), and Milk (Starrbury), are really just benchwarmers. Together, these three friends experience life’s highs and lows. Comedy Central says, “Failure doesn’t faze them since they’re legends… even if it’s just in their own minds.” Hawking and Johnson’s own days, riding the UCLA Bruins’ bench, inspired the main characters. The guys wind up in the penal system after trying to impress a group of girls with their criminal behavior. First aired: August 20, 2017. What do you think? 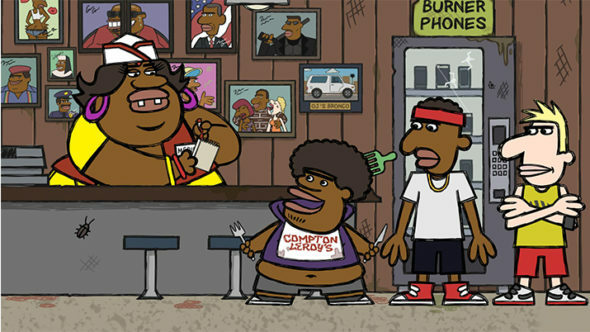 Do you like the Legends of Chamberlain Heights TV series? Should it have been cancelled or renewed for a third season? My husband and I just love this show and find it hilarious. PLEASE bring it back! We keep checking to see if it has returned for a 3rd season. We will keep checking back!!! Funniest show ever , BRING IT BACK !!!! Show was off the hook! One of the funniest, on point shows on TV, of ALL TIME!! Bring it back. Love love love this show!! Please renew!!! I love this show, Funny as can be.